Take a look back at pictures of sewing machines available to our ancestors. You'll find photos of the first Singer sewing machine, but it's a varied gallery that includes a variety of vintage sewing machines from different manufacturers. Many of the ads for the vintage sewing machines in this collection are available as wall-art from a number of companies, printed on either canvas or paper. 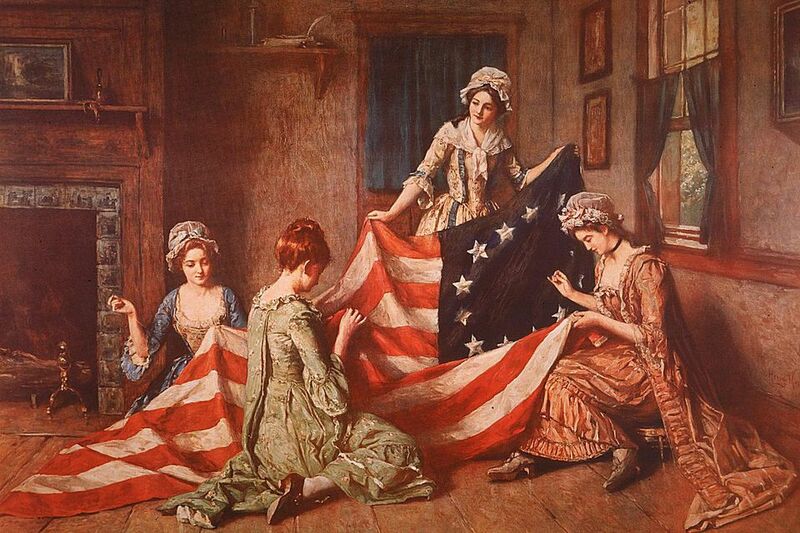 This photo on this page, a Henry Mosler painting called The Birth of the Flag, depicts Betsy Ross and her assistants sewing the first American flag in Philadelphia, Pennsylvania, in 1777. No one, not even her descendants, is absolutely certain that Betsy Ross actually made the first American Flag, but the legend is part of America's history. Read about the first American flag. In August of 1851, Isaac M. Singer was granted a patent for the first Singer brand sewing machine. The machine in the photo was built in 1854 and still in good working order 50 years later. Quilters are still fans of the Singer Featherweight sewing machine, and the earliest models of those machines aren't terribly far from the century mark. This wood engraving shows us the interior of the central office of I.M. Singer & Co. in 1857. The showroom and office were located at 458 Broadway in New York City. Here, a woman is sewing on one of the first Singer sewing machines. Taken in 1865, this photo is of two sisters, one sewing on a treadle sewing machine. The next photo in the gallery appears to have been taken at the same time but was dated 1855. One date isn't accurate but the timing is probably close. Singer began using the S Girl trademark in 1870, and many versions of the logo appeared around the world. This vintage ad was printed in France. This vintage Singer ad illustrates the many nations where Singer sewing machines were sold. I love this colorful ad by New York's Empire Sewing Machine Company. Said to date from about 1870, the ad features the Brooklyn Bridge. The stagecoach and train in the ad seem to relate to the shipping choices that distant buyers could depend on when ordering a sewing machine, but that's just a guess. The photo of this group of young women, sewing by hand and with sewing machines, was taken in 1899 at the Agricultural and Mechanical College in Greensboro, NC. This colorful mid 19th Century ad is for Kerr's Thread and plays on the activities at the New York Stock Exchange. A photo of a vintage Singer treadle sewing machine. Although this photograph is said to be from 1853, the sewing machine appears to be from a later era. This 1902 ad from Denmark illustrates a Husqvarna treadle sewing machine. Reproductions of this image are available as framed art. This French ad for an Elias Howe sewing machine is said to date from about 1900. A vintage ad asking readers to come and try the Royal St. John Sewing Machine. Gnome et Rhone was primarily an aircraft engine manufacturer, but after World War I the company produced other items, too, including sewing machines. Hurtu made sewing machines, automobiles, bicycles and other items. Alex Askaroff has written a history of the company and its sewing machines on his website. This photo, from about 1925, shows a woman sewing on an electric sewing machine. The original caption for this vintage ad places it at about 1900, but it obviously dates from a later decade -- maybe 1930s or 1940s? Who says guys don't quilt! This 1930's era Oklahoma grandmother is working side-by-side with her grandson to quilt a project that's stretched on a frame. This photo is said to be of Mrs. Bill Stang, and was taken in Pie Town, New Mexico in 1940. Mrs. Stang is standing by a quilt that she made, with blocks that represent the 48 states that made up the U.S. at that time. The quilt blocks appear to be embroidered, or made from a combination of embroidery and applique. Quilt blocks are surrounded by patchwork sashing and nine-patch cornerstones. It looks like this little girl is serious about putting fabric under the presser foot of her little sewing machine. The photo is said to date from about 1945. Said to date from 1955, this photo depicts a Mennonite woman showing a Lone Star quilt to two young ladies, both dressed in the plaid that was so popular at that time. I had to chuckle at the 'official' caption for the photo: A Mennonite woman explaining the symbols on a quilted blanket to visitors to the Pennsylvania Dutch Fair in Hershey. It certainly doesn't look like a blanket to me. I doubt most of us would hang a quilt on a clothesline to dry -- yikes, think of the droops and possibly-permanent folds it would create! This photo was no doubt staged to appear vintage, but I like the quilt, which might actually be vintage.